Franciscans—also known as the order of Saint Francis—were the first friars to establish themselves in Cuban territory, subsequently creating the most extensive network of convents on the island. As members of the largest order in Europe during the 16th and 17th centuries, these friars were part of an attempt to bring faith to the native peoples of the New World. 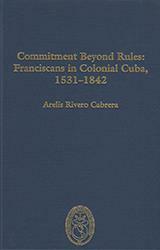 Author Arelis Cabrera uses primary sources to assess the role played by the Franciscans in Cuba’s colonial past. Cabrera explores the expansion of the Seraphic order, which led to the presence of friars in every major town in Cuba, and how the socioeconomic health of the town impacted the establishment of its religious buildings. The evolution of the Seraphic order over three hundred years—from the joining of friars on Christopher Columbus’ second voyage to the Americas up until Spain’s Trienio Liberal government rule in the 1800s—is examined, showing the rise and decline of Franciscans in Cuba. The legacy these friars left on Cuba cannot be understated, as they helped in shaping the island’s history and religion in the forms of pastoral care, funeral services, education and healthcare and more. Commitment Beyond Rules is the fascinating story of one religion’s impact on part of the New World.